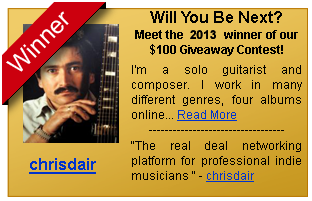 So what’s the big deal with giving away a $100 cash prize to one lucky member of MusiciansIndex.com? That’s a question we sometimes get from visitors to the ‘Home’ page of the website. Well, we never said the money was really a big deal…other than giving the winner a little extra cash to buy some guitar strings or drumsticks, we tend to believe that making it into the Winner’s Box is the real treat! What’s the Winner’s Box you ask? That’s where the chosen Musician, Band, or Music Service gets featured on the ‘Home’ page of Musicians Index for a full year until the next winner is picked! With several thousand views of the page each month our statistics have shown that visitors really pay attention to the “Winner’s Box”. They want to know more about the member by clicking on the link leading to their personal M.I. site. What this means is quite frankly more exposure which is always a good thing! It also provides the opportunity for the Musician, Band, or Music Service to pick up more new M.I. referrals, which can lead to other benefits like additional M.I. points and team building. Because we really don’t like to see them go, we will continually honor our champions here in this article. As a token of our appreciation we will also continue to promote their M.I. sites by driving traffic to the blog post. 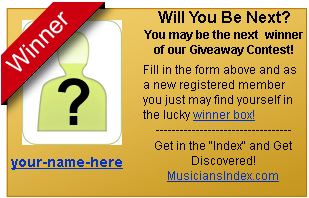 For a chance to see yourself in the Winner’s Box, all you need to do is sign up to be a member of MusiciansIndex.com and complete the simple profile requirements. Just add a profile picture, short bio, and profile preferences and you’re in the drawing. It’s really that easy…and hey, you’ll being doing yourself a favor because these few simple tweaks to your M.I. site will make you more visible to the Search Engine. Remember, it’s all FREE to use and the community is here for you to find each other and benefit! Will You Be Next? Join Us Now! People looking for musicians for hire for their functions have a very easy task these days because they can put the internet to good use. It is possible to use the internet in order to find a huge range of musicians available for hire for a variety of functions, whether they are weddings or ant type of corporate or private event. As a matter of fact, increasing numbers of people prefer to use the internet to search for a variety of things. Most musicians are also changing the way in which they look for business. They prefer to use the internet to advertise their services because of the many conveniences this medium offers. The main reason for this is obviously because this is where prospective customers are looking for musicians for hire. There are plenty of musicians’ classifieds sites on the internet where there are musician wanted advertisements of all sorts. This makes finding musicians for hire a very easy job that takes very little time. There is no denying the fact that using the internet to find musicians for hire is extremely convenient for most people. There are many musicians classifieds available online which makes it likely that a person will encounter something that is suitable. It is also very east for you to specify the kind of musician wanted advertisements you want to see so that your search criteria are narrowed down, thereby giving you the best possible results. One cannot stress how much of time is saved due to this reason. The best thing about the musicians classifieds available online is that it does not cost you any money to access them. This certainly makes them very popular with people since they can post free messages in various websites, thereby considerably increasing their chances of success. You can look through all the musician wanted advertisements that a website has after you create an account with them. You will find it a very simple task to create an account on the various musicians’ websites available and it rarely takes more than a minute. You can even set your search criteria so that you only get results that are relevant to you which may vary from time to time. You can use a number of websites, or at least the most popular one, so that you come across plenty of advertisements placed by musicians who are looking to be hired for functions. The internet has made it very easy for you to look for musicians you could hire for your functions. You do not have to inconvenience yourself at all because you can conduct your search at any time of the day. What’s more, you can even search for musicians right from the comfort of your home with only a few clicks of the mouse. These free musician wanted advertisements available online are accessible easily and you can go through as many ads as you need to select the perfect musicians for your event. The benefit of using the internet to look for musicians does not end here. You can also use it to find out more information about the various musicians you discover using musicians classifieds ads. This is a very essential part of selecting musicians you could hire for an event since you need to make absolutely certain that will be able to perform properly. There might be a huge difference in what is written in an advertisement and what the musicians can actually deliver. The internet can help ensure that your selection is the right one and that your function goes off very well as a result. There are many things to be taken into account when you are looking for a band to play with. There might be many musicians who respond to your musicians wanted advertisements but they might not necessarily share your musical style or even plans for the future. Any tie up with these musicians will only be short lived and will take you further from your goals. Another thing that you should take into account when you are answering musicians wanted ads or placing ads of your own is that the musicians you find should share excellent rapport with you. This, apart from artistic compatibility, ensures that you have a great time together and will remain together for as long as is mutually beneficial. You cannot afford to ignore this point while selecting a band to perform with because it can lead to problems very soon. You have to be very proactive in case you wish to find musicians who can take you into their band. The best way to proceed is to place musicians wanted ads or band wanted ads in the places where they are certain to be seen by the right people. Your ads should also be seen by a large number of people so that your chances of success increase. Thankfully this is an easy task in the digital age. You should also take steps to spread the word in music circles that you are looking for a band to join or that you want to bring musicians together to form a band. Your communication should be very clear otherwise you will waste a lot of time on dead end leads and this will lead to a great deal of frustration. This is easy if you have a lot of contacts already. You will need to increase your list of contacts if you don’t have an extensive list. You can make your task very easy by joining a musicians online group where you can network with like minded people and communicate your requirements to them. Any musicians wanted ads or band wanted advertisements you place on these websites will get a great response since many musicians frequent these sites. Not only will you easily find a band to join but you will also get great commercial opportunities because these websites also feature lots of musicians for hire advertisements. This is hardly surprising since many people are now turning to the internet for a whole lot of needs. You will find it very easy to find a band to join if you first join a musicians network. You can achieve your objective of forming a band with the least effort and cost because these websites do not charge any money for their services. Not only will you join a band soon but you will be able to get lots of bookings because of the musicians for hire advertisements that you will see on these websites. You will soon be able to realize your dream of earning a living doing what you love. Do you feel that your musical career lacks direction and that you are suffering from a form of creative stagnation? This is quite a common complaint with creative people because they are always in need of intellectual stimulation. A musicians network might be the best way you can get your creative juices flowing again so that your career is on the right trajectory again. After all, you might find it difficult to earn money if your creativity has been stalled for some reason. People who share common interests like to spend time together and this is particularly evident in the case of creative people such as musicians. These meetings have a great role to play in shaping a musician’s style because it exposes him or her to a huge range of musical trends and ideas. Your musical style and therefore your career will therefore benefit greatly if you are in regular contact with other musicians who are all members of a musicians network. A free social network for musicians can have a great impact on your career. A musicians network is a really great place for every musician to spend time for a great many reasons. While you will certainly find great inspiration for your music, you will also find plenty of partners who you can work with in order to create music. This can be achieved with the help of the musicians classifieds section available on most free social networks for musicians. You will also be able to stay abreast of the latest developments in the business because of all the information available. There are many more ways in which websites for social networking for musicians can give your career a much needed boost. This is a great place to get in touch with potential clients who are looking to find musicians for hire. Many clients, event managers in particular, visit these sites in order to book musicians to perform at events they are organizing. Your presence on sites such as this will guarantee you plenty of bookings. You can also build your image in the music community by being an active member on various online forums. There are many websites for social networking for musicians which have extremely active forums and which will help give you a voice in the music community. You could also post audio and video clips of your music so that people get to know and understand what you are doing. You certainly need to meet with as many musicians as possible because this is the best way to further your career as well as your growth as a musician. One thing you should always keep in mind is that potential customers will most likely go to the internet in order to find out more about you before they give you a booking. Make sure that you have adequate presence on the internet and that customers get a good impression of you. A free social network for musicians is a great way to achieve this. There is no reason for you to not rely on online social networking for musicians because it is absolutely free. Not only will these sites give you the opportunity to spend time with like minded people but they will also help improve your career tremendously. Musicians from all over the world are joining these websites because of the obvious advantages they offer. You too should do the same in order to watch your career take off. The consequences of not doing so and staying aloof from the rest of the music fraternity might be too much for your career to handle. Most aspiring musicians face a major hurdle when they need to find musicians who can get together with them in order to form a band. Have you too been trying to join a band for a very long time but with no success? If you do not know too many people in the local music fraternity you will certainly be at a loss at how to proceed. Most musician’s careers depend on their ability to find a band where their musical talent can be utilized to its best potential. You cannot avoid the fact that you have to put in a lot of time and effort to find musicians you can collaborate with. There are bound to be many bands looking for members but you should only join a band if you feel that there will be mutual benefit from doing so. Many musicians’ careers have not taken off because they could not find a band that truly compliments their music style. It is a popular belief that only those people with a lot of contacts in the musical industry can find musicians to perform with. This is definitely true up to an extent because one has to meet a whole lot of people before finalizing the final few who will get together to form a band. A person without contacts will find it very difficult to use word of mouth or to ask for references and might therefore find a band with the greatest difficulty. Even spending time at recording studios and record shops will have limited effect only. You have to be prepared to put in a lot of hard work if you use these methods to find musicians to play with. You should also be extremely fortunate. However, you obviously require a better method to meet other musicians and to find a band that is looking for what you have to offer. You also need to move fast because you cannot afford to waste too much time on this process. The best way you can achieve your goal of being a successful musician is to use the internet. In fact, there are many instances of musicians’ careers having become successful because they were able to find a band online. You can join a musicians’ website in order to have access to their classifieds section. There are plenty of websites that cater to almost every niche. This will ensure that you will certainly find what you are looking for with a minimum of fuss. The other advantage is that these classifieds can be used completely free of cost. You will be surprised at the large number of advertisements you see on these websites. All of these advertisements are connected with music in some way or the other because these websites are a great place for people to exchange information. You can go through the advertisements at your leisure to find a band that suits you well. If needed, you can also place your own advertisement free of cost and will receive excellent responses. The best thing about these websites is that they provide you with many leads to follow up on. They are the best thing for musicians’ careers because they ensure that they can select the best partners who provide creative support for the long term. You will find a band that suits your musical style the best so that you derive great satisfaction from being part of it. You will also find perfect compatibility with musical partners if you select them carefully and this will ensure that the collaboration lasts for as long as possible with the best results. The world is a very small place today because the number of inaccessible places keeps on shrinking. One of the main reasons for this has been the advent of the internet age. Today we do not think twice before trying to contact a person in a different part of the globe since the internet has made it possible. One of the best things that the internet has done is that it has given rise to a great many internet communities of people sharing the same, and sometimes, esoteric interests. If you are a musician then you will benefit a lot by joining an online community of musicians. A good musicians network is an invaluable tool for an aspiring musician who wants to get ahead in his or her chosen profession. A musicians social site is a great place to meet like minded people and to exchange ideas but you have to find one that suits your requirements exactly. You can begin by creating a profile on these sites in order to become more visible. You could also use the site to disseminate information about yourself, including the music you are interested in. You could even upload videos about yourself because they have a greater impact than just written material. These websites also have plenty of musician classifieds containing many useful musician wanted ads. You will obtain the biggest advantage from being on these online sites if you are looking for work since many clients also place musicians wanted ads on them. Needless to say, you have to be registered on the more popular sites so that you will have access to the largest number of ads and the ones which offer the most lucrative contracts. This is probably the best way that you could earn a living by doing something that you love very much. Another advantage of going online to network with other musicians is that you will be able to place musician wanted ads in case you want to create a band of your own. These ads will reach their targeted audience and you will therefore find it very easy to find a new band member to complete your band. You should be very clear in your communication in your musician wanted ad so that you find the most suitable band member. Online musical communities are great places for musicians to hang out because they can do more than go through musician classifieds to read musicians wanted ads, although these are undeniably important. You can get exposed to a world of musical influences and can catch trends just as they start if you spend a lot of time on these websites. You have to focus your attentions on any one musician website or at least on a couple of them. You should choose one on the basis of how active and original its musicians forum is and whether it has musicians wanted ads that are useful to you. This way you can use the internet to increase your exposure to music and benefit greatly from it. We live in the internet age and this age is characterized by the use of information technology to do a great many things. We can easily use the internet for education, entertainment and also to earn a living. One of the things that we use the internet for is to increase our contacts with other people by a process that is popularly called networking. The whole world has seemingly started networking in order to enhance life and career prospects. Musicians too have started using this powerful tool in a variety of ways. Musicians use networking in two main ways and for different but interrelated reasons. One reason is that it gives them exposure to various musical influences from all over the world. This helps a musician to develop his or her style into something distinctive. It also helps to make the musician more visible in a world that is already quite crowded with many people trying to make a mark. The other use of networking is that it helps a musician identify and explore many more business opportunities than traditional methods would permit. As a musician, you have to find an online musicians network that seems to meet your requirements. You will find them to be very useful because they have a musicians forum where you can glean a lot of ideas and also make many contacts. 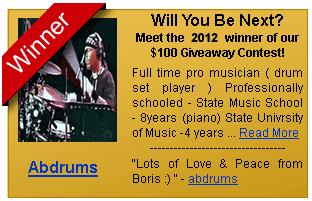 You will also find musician classifieds that have plenty of musician wanted ads that can help take your career further. Since they are usually free of cost there is nothing preventing you from making full use of them. If your band is lacking one person you could network online in order to get leads about people who might be interested in joining your band. You could also be more proactive and place musician wanted ads in online musician classifieds. It is unlikely that you will not get a response especially if you are using a website that is popular with lots of local musicians. Since these ads are usually free, you can place as many as you want. There are many people who will respond to your musician wanted ads but you should verify that they are indeed good to work with. You can use an online musicians network to do this as well because there is bound to be plenty of feedback and reviews on a particular person that will prevent you from making a mistake by hiring or collaborating with them. Music websites are certainly helpful in taking your career ahead especially if they have plenty of musicians wanted ads. These ads will also help you get in touch with event managers who have a regular requirement of musicians for various events they are organizing. However, what is really useful about them are their online forums because there is no better way that you can get as much information about music as you need. There are many websites available so you should make your choice carefully and only join the one that gives you exactly what you want. There is no better way than this for your career to get a boost. There is more starting a band than just knowing how to play music. You do need to have musical talent to begin with, but you cannot achieve this all on your own. A band is a collaborative effort and you therefore need to be able to bring together other people who can add value to the band. Finding the right musician to complete your band is not the easiest of tasks but you do have to complete it in order to get your musical group off the ground. You might have great ideas for forming a band but you cannot do anything about your ideas until you find other people who share your interests and are willing to put in some effort as well. It is the synergy of different talents and the shared desire to be a success that will make your newly founded group a great success. You therefore have to ensure that you leave no stone unturned in order to find the right musician to complete your band. The simplest way you can start your search is by placing musician wanted ads in different classifieds. You are sure to find success by following this method because almost every musician looking for an opportunity to play will be looking through them. You should also make it a point to spend a lot of time in record stores, rehearsal and recording studios where you can meet many musicians. Even if you are not permitted to put up a musician wanted ad here, you will at least be well known in a musician’s network and might get some great leads about a person looking to join a band. You are on the right track if your musician wanted ads are placed in publications that are read exclusively by people from the music industry. You should only use musician classifieds because you can be sure that you will get the best results from them. This is also the most economical method of trying to find musicians for your band since it targets the right people. The major advantage of using musician classifieds is that they are rather inexpensive when compared with how targeted they are. However, if you cannot afford them you can turn to the internet for assistance. There are many websites where you can place musicians wanted ads for free. You can therefore liberally sprinkle these sites with your musicians wanted ads. Your task of finding the right musician to complete your band is not finished until you verify that the prospective band member gets along with other people in the band. While musical talent is undeniably important, the prospective band member also needs to have the right personality so that the band benefits from the synergy. You will certainly find many prospective band members if you place musicians wanted ads in the appropriate music classifieds. However, it takes a lot of effort to select the people who will be able to work well together. The entire future of your band depends on how much of effort you can put in during this stage. Have you ever wondered how certain bands came together to create wonderful music? More importantly, how did they last for so long considering that the band members usually have powerful personalities and do not always agree on every point, even when it comes to music? You will be surprised to learn that many famous bands of the past few decades were actually brought together by a person who had the vision and went looking for people to fit the part. Therefore, while many bands came together as a result of friendship and old association, many other bands were created from scratch as a result of musician wanted ads. There is no denying the fact that it takes a lot of effort to build a band from scratch. The choice of people has to be done carefully in order to ensure that their musical talents complement each other and so do their personalities. If you are planning to start a band then musician classifieds will come to your aid. You can make your job a lot easier by using online musician classifieds because it can be done from the comfort of your home. The musician wanted ads that you put here will help you get in touch with many local musicians without too much trouble. Your musician wanted ad should be written with a great deal of precision in order to ensure that you communicate your requirements precisely. This will save you a great deal of confusion and effort later on. You will also encounter many musicians wanted ads that might seem interesting enough for you to join another group of people trying to make a band. There may be many opportunities here and you should not neglect them. You should not select the first person who responds to your musicians wanted ads. Take your time and only select the person who has all the qualities you are looking for in a band member. This is one of the best ways of ensuring that your band gets off to a good start. The internet offers you many opportunities for building a band from scratch. Joining an online musicians forum will help you meet and network with other local musicians. They can also pass on leads about people who might be interested in working with you. You can also use the internet to search for videos of live performances featuring your prospective band members. This method will also help you eliminate certain people as being totally unsuitable to join your band. As you can see, it is very easy to form a band from scratch if you make use of the internet for networking and searching. This will save you a great deal of time and effort and you will actually be able to get better results since you will be able to refine your search properly. Before long, you will be the member of a musical band and will be able to follow your dreams of being a musician. Are you in the midst of planning a function for which you require a band? This is a task that is sure to occupy a lot of your time and effort because you cannot afford to neglect even the smallest detail. There is no denying the fact that music is probably the most important aspect of the arrangements because there is so much that can go wrong if arrangements are shoddy. Music is an important aspect of almost any gathering of people and this makes it even more important that you make arrangements properly. The simplest way of finding the best band for your function is to place musician wanted ads in the appropriate places. The band that you select for your function should certainly be talented and be able to play the kind of music you want. However, another important quality is reliability and the band should possess that. You can reduce your work load by placing musicians wanted ads in the right musician classifieds. The best thing about using musician classifieds is that you will be able to reach your target audience without any trouble. You should be very systematic in your approach to selecting the best band for your function. You have to carefully choose the publications where you will place your musicians wanted ads. It will save you a great deal of bother and time if you specified exactly what kind of band you require because you certainly will not have the time to respond to every query that comes your way. You will be pleasantly surprised to see that a musician wanted ad is not too expensive. However, if you wish to cut costs even further then you should place free ads on various websites that are devoted to the subject of music. If you are online, it might also be a good idea to visit a musician forum in order to learn more about the various bands available locally. Once you identify some bands as a result of the musicians wanted ads you have placed in various places, you should then begin the process of short listing them. One way to do this is to audition them yourself. The other is to see them performing at some other event. This will help you gauge their ability to entertain a crowd because this is a very essential requirement of a band. This important step might save you a great deal of embarrassment later on. Your musician wanted ads might give you the best possible band for your function but you still have to get some paperwork done. A contract is the best way to spell out mutual requirements and expectations so that you do not face any problems due to communication when the date of the event draws nearer. This professional approach will spare you a lot of headache later on and it will also reassure the band that it is dealing with the right person. You will be able to focus on other work for your event knowing that the music has been taken care of satisfactorily. 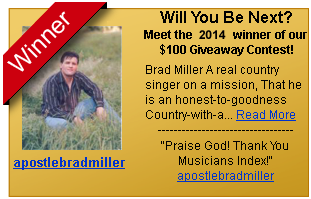 ALERT: Win $100 Dollars & get in the Winner's Box! Fill out the form below and you'll be entered into a monthly random drawing to be added as a Featured Artist. One Lucky Winner will then have a chance to win $100! Rock and roll hall of fame on Steve Perry Is A San Francisco Giants Fan! lida dai dai on MusiciansIndex.com…It’s Not just another social site! bet365 on Steve Perry Is A San Francisco Giants Fan! Jim Taylor on Steve Perry Is A San Francisco Giants Fan! Jim Taylor on MusiciansIndex.com…It’s Not just another social site!